Do you enjoy writing notes in the margins of books and articles? The quest for an online marginalia system continues with Instapaper. Instapaper offers the great service to export articles to their service. 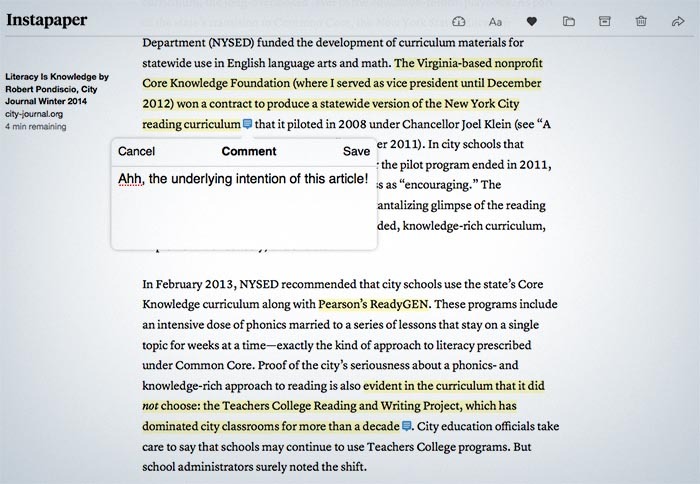 You can even highlight passages and leave comments on the article. However, your comments are buried underneath a blue word bubble. You have to click on the blue bubble to read your comment. Blah. I want to read it right alongside the article! It’s also curious that the desktop version of instapaper does not have the export features “Share All Notes”. The mobile version provides this option at the bottom of an article. However, the desktop version is missing this important feature. It’s kinda crazy, but my best method for keeping my marginalia still stands as exporting articles to be read as PDF files and then annotating those PDF files.